At long last, the second installment of the Jason Hammond series of conspiracy thrillers, which began with 2013’s hit Frame 232, is available! WHATEVER HAPPENED TO THE ‘AMERICAN DREAM’ WE WERE ALL PROMISED? LAS VEGAS, NOVEMBER 1970—In a darkened suite on the top floor of the Desert Inn, billionaire Howard Hughes gives his last will and testament to twenty-year-old Chase Wheeler. Just over a week later, Hughes’s minders abruptly move him out of Las Vegas in the middle of the night, and Chase Wheeler vanishes without a trace. PRESENT DAY—Demolition expert Randy Miller discovered forty eight pages of Hughes’s rough notes just hours before the Desert Inn was imploded. Still in financial straits due to the Great Recession, Randy and his wife Jeanine decide to put a few of the pages on eBay. Days later, the Miller family is attacked by a gunman who wants them all. The Millers take their children into hiding and contact the only person they feel they can trust—Jason Hammond. Jason reads through the cryptic notes and realizes they contain a great deal of information about Hughes’s legendary lost will. If discovered now, it would endow certain people with great fortune while stripping it from others—more than adequate motivation for someone to bring a professional killer into the equation. But the situation is far from that simple, and Jason’s investigation eventually leads him to the chilling truth behind the economic decline of America’s working classes—and the terrifying reality that those responsible for it aren’t done yet…. After a five-year hiatus (2012’s The Gemini Virus) from the disaster-thriller genre, Wil has finally returned with a new story to scare the daylights out of everyone. It has already been receiving a phenomenal reaction from pre-pub reviewers! Silver Lake, Pennsylvania, is hit by a monster storm. When a massive lightning strike hits one of the nuclear reactors that provides power to Silver Lake and much of the state, essential components fail. Explosions and containment breaches follow. Radiation pours into the storm-wracked air. Preparing for a storm was one thing, but all the duct tape, plastic tarps, and particle board in the world won’t protect the townspeople from the fallout. Sarah Redmond, acting mayor of Silver Lake, and her husband, an EMT, find themselves battling the storm and nuclear disaster simultaneously: flash floods and evacuations, downed trees and radiation sickness. Staff at the power plant scramble to determine the extent of the damage and stop the leaks. Everything’s being streamed onto the internet by Marla Hollis, a local journalist who happened to be in the right place at the wrong time. Trapped at the plant, she’s determined to get the story out at any cost. Nuclear disaster, not in far-off Chernobyl or Fukushima, but on American soil. How much of Pennsylvania will become a radioactive nightmare for generations to come? The promotional video for Fallout is here! It’s a one-minute clip that’ll have you on the edge of your seat, and it’s already drawing an incredible reaction from fans! Click HERE for the 480p version, which is relatively small in both frame rate and file size, but it will load and play immediately. Click HERE for the 720p HD version, which is larger and has phenomenal quality, but may take a minute to get going. Please don’t hesitate to share this with everyone you know! And remember—Fallout releases worldwide on April 25th…. Full Cover for Fallout Has Been Revealed! 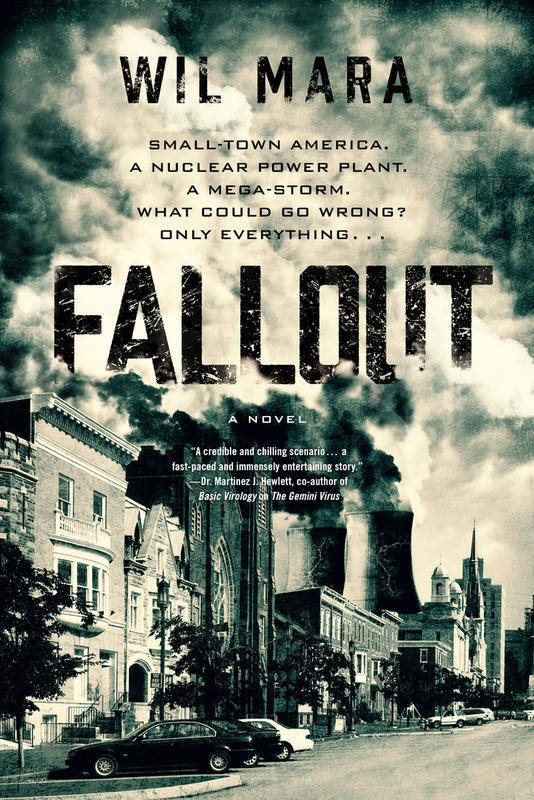 Macmillan Publishing has just revealed the full cover of Wil’s upcoming disaster thriller, Fallout. If you have any trouble seeing it via this post, click here. As a reminder, Fallout releases worldwide on Tuesday, April 25. To reserve your copy on Amazon now, click here. Last Day of the Fallout Giveaway! This is the last day to get in on the Fallout giveaway! Five free copies of Fallout, Wil’s latest disaster thriller, will be given away through the Goodreads site. Don’t miss it! For information about the book, check out the publisher’s page here.